This Hammered Wedding Ring is sublimely beautiful with the mashup of textures. We can make these rings from 6 to 16mm wide and in a variety of profiles as well. It would also be possible to make the outer rails wider and add stones to them for some sparkle or color if that is what you wanted. We also have a few finishes that can be used to further customize your ring like stone, brushed, matte, etc. The starting price is for this Hammered Wedding Ring in Gold at 6mm wide. Contact us for other pricing options. 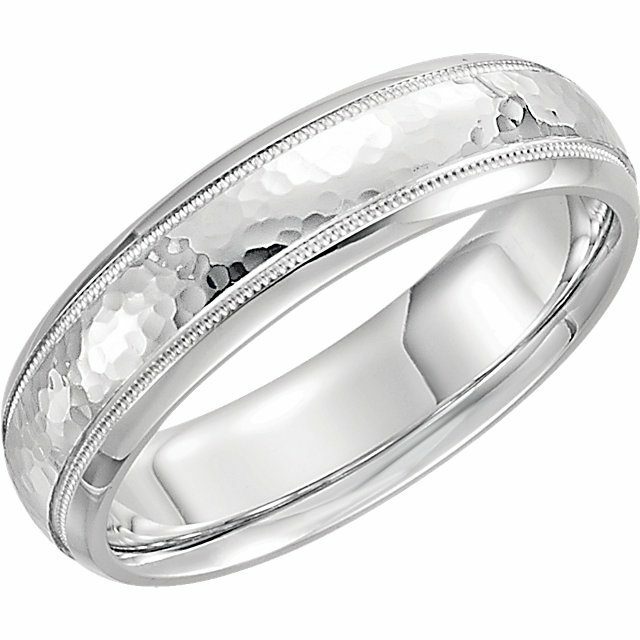 Click HERE to see another Hammered Wedding Ring design. Click HERE to learn more about custom jewelry, to see our portfolio, or to contact us about a Hammered Wedding Ring. It can cost less than you think to have your very own custom engagement ring made just for you. Why hassle with the retail stores for boring and overpriced engagement rings?